The Convention Centre (Shaw Centre) is on Colonel By. It connects into the Westin and the Rideau Centre. Due to the canal and the bridges, it is a bit of a tangle getting around. 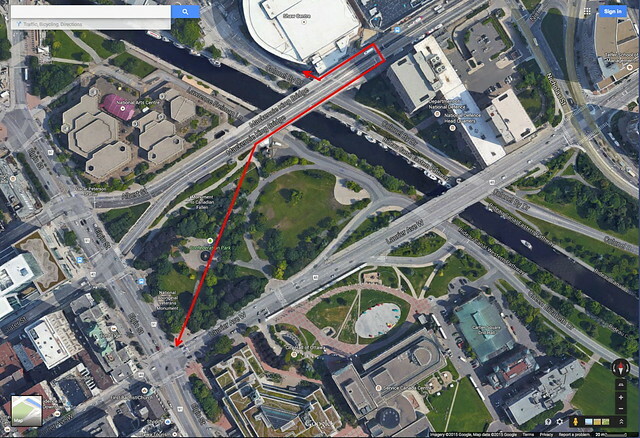 Here's a map showing how to get from the Convention Centre to/from Elgin Street (for access to downtown), by going across the bridge and the park (on the north side either using the convention centre stairs as shown, or by accessing the bridge from Rideau Centre). The south side of Rideau Street has entrances into the Rideau Centre. Rideau Street has local buses, eastbound (away from downtown) on the south side and westbound (towards downtown) on the north side. Rideau Street turns into Wellington Street when you go west. Parliament Hill is west on Wellington. You can walk north-south on Colonel By. There is also a north-south path along the river. The Mackenzie King Bridge can be reached through the Rideau Centre (next to Nordstroms, upper level), or by stairs next to the Convention Centre. The bridge has Transitway buses, which are also local east-west buses through downtown. Westbound (towards downtown) on the north side of the bridge, eastbound (away from downtown) on the south side. If you want a much longer route to go to the downtown core area, you can walk south along the canal to a pedestrian bridge (the Corktown Bridge) across the Rideau Canal at Somerset Street. The transit system is OC Transpo. Thanks to municipal open data, there is a really good app called BusBuddyOttawa. It will tell you when the bus is actually coming. take any westbound local OC Transpo bus from the north side of Rideau Street (across from the Rideau Centre). The 9 and 12 will take you as far as Bank & Slater, the 2 will take you to Bank & Somerset, and the 1, 7 will take you far south along Bank. NOTE: Don't take the STO buses, unless you want to go to Gatineau. They're from the Quebec transit system. OC Transpo also has a trip planner. The bikeshare is called VeloGo, Twitter @VeloGoCanada. As of this writing I don't know if it will be open by May. It is not yet available (as of May 24, 2015). The downtown has no protected lanes other than a short east-west bike lane on Laurier Avenue. There are lots of completely separate recreational pathways along the canal and the river, but they really are for touring around the waterfront, not so much for reaching things in the downtown grid. See previous blog post for info about Ottawa restaurants and shopping. There are many open data related events coming to Ottawa in 2015, from May 24 to June 5. Ottawa is a fairly typical small North American city, transformed in the post-war by "urban renewal", highway infrastructure, removal of streetcars and suburbanization. See next blog post for how to get around Ottawa on foot, by bike or by transit. The closest independent bookstore to the convention centre is the very good Perfect Books, at 258A Elgin Street. Farther afield there's Books on Beechwood, at 35 Beechwood Avenue in the New Edinburgh neighbourhood and Octopus Books at 116 Third Avenue in the Glebe neighbourhood. Most of the magazine stores have closed. Mags at 254 Elgin Street is still holding on, but is mostly a gift shop now, along with its sister store boogie + birdie next door. Farther afield is Byward Market News, which is now located in the Westboro neighbourhood, and is also the Toy Soldier Market, 1242 ½ Wellington Street West. Despite its name, the Byward Market is no longer the central farmers' market in Ottawa. People still go to buy from various shops (cheesemonger, butcher etc.) but not so much from the stalls. The market is the main reason to go to Lansdowne, everything else there is a chain store or franchise. Here's some information, partially adapted from my post JCDL 2011 in Ottawa. A map with some restaurants - mostly ones I have been to (and like a lot), as well as a few others that are highly recommended. Most of these places fill up fast, so you should make reservations. NOTE: As this map is from 2011, some restaurants have closed or moved; I will be making a new map. All restaurants below will be made into an open data list. There are restaurants and pubs along Elgin Street and Bank Street. There are also lots in the Byward Market, but I don't know the Market very well. The Convention Centre (Shaw Centre) is located right downtown. It's important to understand that the downtown core (Centretown) only has a population of about 20,000. Most people commute to downtown. There is a restaurant in Nordstroms in the Rideau Centre (attached to the convention centre), one of their Bazille brand. It has a patio. I haven't been. Just east of the Rideau Centre, at 408 Dalhousie (east of Nicholas), is Kothu Rotti - Sri Lankan food, mostly for takeout. You can get a generous portion of curries for $9. Anne DesBrisay gave it a positive review. I also really like its parent restaurant Ceylonta. By far the easiest thing from the Convention Centre is to go to the Market (Byward Market) which has a reasonable selection of restaurants and a nice street experience. It is mainly visited by tourists and the lunchtime crowd, so it (like Sparks Street) has a bit of an artificial quality. You can get excellent sandwiches at La Bottega Nicastro, 64 George Street. Go way in to the back of the store to the sandwich section. If you want a really quick meal in the market, Shafali Bazaar is a small curry shop at 55 Byward Market Square (in the Byward Market Square building). Shafali has two other locations in Ottawa. Ottawa's inexpensive, ubiquitous fast food is shawarma, to the point that Ottawa calls itself the unofficial shawarma capital of Canada. See e.g. The city of shawarma. There are shawarma places everywhere. Please don't go to Metropolitain, on Rideau at the edge of the market. It is not good. I'm told Milestones (a Canadian chain on the upper part of the same location) is ok. There is good shopping and some good eating along Dalhousie at the edge of the market. It's the only Market street I actually go to consistently. It runs up basically to Das Lokal, at Dalhousie and Saint Andrew. If you want a high-end dining experience, just go to Beckta. It's at 150 Elgin (a new location), a 10 minute walk from the convention centre. The downtown core is basically the Central Business District (CBD) north of Gloucester, and Centretown, south of Gloucester to the highway (the Queensway). I know this area best. The good news is there are many excellent places to eat in Centretown. The bad news is there are many terrible places to eat (mostly serving the lunchtime commuter crowd). The trend in Ottawa is small plates, with locally-sourced ingredients. I have grouped somewhat arbitrarily into lunch/supper/brunch/takeout just based on when I usually go and what I usually do but obviously your schedule will be different. I usually get the bean rolls. And the jalapeno quiche (but they don't always have it). Note: DON'T go to Cafe Saffron (next to Cafe Delice). Cafe Saffron is not good. There's lots of Chinese, Vietnamese (pho) and other cuisines along Somerset Street West starting roughly west of Percy and running to Preston. The Chinatown Gate marks the notional entrance to Chinatown at Bronson and Somerset. Little Italy runs along Preston. I will post a longer list of restaurants and shopping (including places farther afield) in my Ottawa blog. There is Calforex Currency Exchange / Bureau de change (it has the best rates) on the 3rd floor of the Rideau Centre shopping mall, there are also other currency exchanges in the downtown core. Below is probably way more than you need to know about Canadian money, from an OECD blog post I wrote for a conference they had in Ottawa in 2007 (now only available from archive.org). This info will sound pretty basic for anyone who has been to Canada or who is used to using debit and credit cards, but I thought it might be useful. a two dollar coin, bi-metallic with an outer silver ring, slightly larger than the dollar coin, often called a "toonie"
Rather than carry large amounts of cash, however, many Canadians use transaction cards, and almost all stores are equipped with card readers. Canada is in the process of transitioning to chip & PIN technology - most card readers still support magstripe reading, in addition to chip reading. For a debit card, some stores, commonly large pharmacies and grocery stores, also offer "cash back", which is the equivalent of a bank withdrawal - the maximum is usually $50 to $100. There is a slight tendency to use debit cards for smaller purchases and credit cards for larger ones, however most stores won't be surprised to see you use a card for a purchase of any amount from tiny to large; many Canadians, including myself, carry little or no cash and use cards for almost all transactions. All of Canada's major banks provide ATMs (bank machines) throughout Ottawa. ATMs usually charge withdrawal fees. Do be aware that within stores you may also find so called "white label" third-party bank machines. While these are safe to use, they charge even higher withdrawal fees than bank ATMs. There are TD Bank machines on the ground floor of the Rideau Centre shopping mall, if you enter from Rideau Street, underneath the skyway to the Bay, the machines will be on your left, just past the Shoppers Drug Mart. Both debit and credit card networks are interlinked with major international networks. The use of cheques to pay in stores is virtually non-existent; I don't think I have ever seen someone pay by cheque in a store in my entire life. Stored-value card use is also minimal. A big line-up of open data related events in Ottawa, Ontario, Canada. Please note: most of these events require separate registration. see @opennorth and hashtag #CODS15 for more information. see website http://opendatacon.org/ and hashtag #IODC15 for more information. May 28 social: 7:30pm Open Knowledge community / School of Data meet and greet at The Brig Pub, 23 York St.
Richard Burcher of Ottawa OpenStreetMap will speak. 7pm at James Street Pub. Note: this is a small meetup group. Session Title: Libraries and Open Data. How Open are We ? Session Title: Libraries Preparing for the Research Data Deluge ?